Twilight made him a household name, but since his explosion in popularity, vampiric heartthrob Robert Pattinson hasn't been content in letting fame shoehorn his career. His next role is proof: Pattinson is reportedly attached to star in Mission: Black List, a psychological thriller that puts him in the shoes of real life Army interrogator Eric Maddox. Maddox was influential in the capture of Saddam Hussein, his tell-all book (on which the film is based) revealing in detail how he used non-violent, mind-bending methods to draw out the information he needed. First thing's first: Pattinson may come off as disaffected as his Twilight counterpart when he's strolling red carpets, but it's only because he's a serious actor looking to leave the celebrity status out of his work. Between the installments of the much-loved franchise, he's tackled biopics (the Salvador Dali film Little Ashes), realistic dramas (Remember Me) and period spectacles (Water for Elephants). We've only seen a sliver of what Pattinson is really capable of, but his willingness to explore a range of stories, themes and characters is proof that he's more than capable of getting down and dirty in a thriller. The road to legitimacy can be a tough one for actors who exploded on to the scene at an early age, but Pattinson is following the right course. Like Matt Damon, who dabbled in high drama with The Talented Mr. Ripley, The Legend of Bagger Vance and All the Pretty Horses before tackling the role of Jason Bourne in The Bourne Identity, Pattinson has established himself as someone with the chops to take on movies that seem "out of his range." The masses underestimated Damon when he made the jump because he was scrawny and brainy — not a typical action hunk. 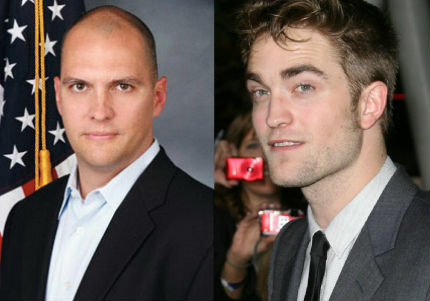 Pattinson's in the same boat, but that's why Hollywood's finest have personal trainers! Speaking of physical makeovers, a role in an military-centric movie provides Pattinson with a much needed motivation to lose his recognizable look. If he's going to become Eric Maddox, he's going to have to look the part — and that means dropping his head of hair. And he'll do it — Pattinson may be reserved in real life, but he's never strayed away from adapting to a part. Diamond skin may be insane, but he did it because he had to. A shaved head and a few pounds of muscle may be a small detail, but it goes a long way for an actor looking to dispel preconceived notions. Pattinson should have no problem kicking his image into high gear. Judging from the previous work of director Jean-Stephane Sauvaire (who is set to helm the project), Mission: Black List should be a highly-kinetic, often-frightening dissection of the American occupation and the hunt for Saddam. The movie will require an energized performance from Pattinson, the other end of the spectrum from most of his films. But never forget his time spent in the world of Harry Potter, where the actor was dropped into action as the star player in the Goblet of Fire competition. Heck, he even smiled in that movie! If Black List segues into moments of action, Pattinson seems fit for the task. With Breaking Dawn - Part 2 in the can and ready to be unleashed into the world, Pattinson is planning carefully for the next stage of his career. He could easily play it safe — see Zac Efron in The Lucky One as evidence. But instead, he's capitalizing on his own draw to collaborate with visionary directors in wild projects. The weirder than weird Cosmopolis, directed by the legendary David Cronenberg, will redefine Pattinson when it hits at Cannes this May and theaters at the end of the year. Mission: Black List should complicate him further. Even if the film is a disaster, if he ends up being entirely miscast, the risk factor is reason enough that Pattinson belongs in the movie. Like his Twilight costar Kristen Stewart, who is also mixing it up in 2012, Pattinson is laying the tracks for a diverse career that will allow him to do whatever he wants in the future. He needs this movie, which means he'll push himself to make it great.